TNS Connectors are registered to UL and CSA standards. Designed extremely small so that its excellent seal can be demonstrated in a narrow,complicated space such as inside the equipment. 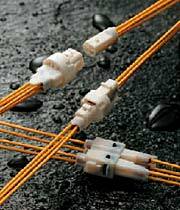 A split type which is composed of two connectors on F side,is super small and give excellent seal. Super small type sealed connector is suitable for passing through small hole.